One of the lovely benefits of sharing interviews on my blog is the opportunity I have to meet wonderful people from around the world. 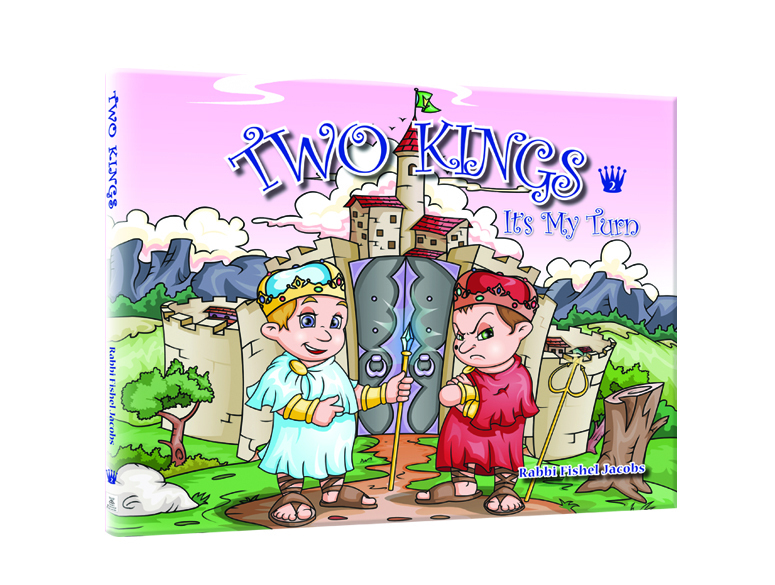 Rabbi Fishel Jacobs is the author of the Two Kings books for children. He lives with his family in Kfar Chabad, Israel, a suburb of Tel Aviv. Rabbi Jacobs has many talents. He has written seven adult non-fiction books, served in the Israeli army, and is an eight degree Black Belt! I’m delighted that Rabbi Jacobs was able to join me for a blog interview. Tell me about your Two Kings books. The Two Kings book series actually evolved from a play we performed for many years in front of tens of thousands of youth in Israel. The play, as well as the books, feature a main character, David, 8. He is charged with performing some sort of daily activity, such as helping watch the baby sister, do homework, whatever. Through simple text and really marvelous brilliant colored pictures we “see” and “hear” an internal Bad King trying to influence David not to do what he’s supposed to. Then we watch as the internal Good King responds with counter-arguments. Finally, we watch as David is torn and struggles to decide with which inner voice, inclination so to speak, he will go. What inspired you to write books for children? First, I’ve always loved children. I love to tell my own children stories at the Shabbat table, and before they go to bed at night. I personally have been influenced greatly by inspirational stories which I’ve been fortunate enough to have read or heard. Stories are an important of the human experience. Second, I think this message of two little voices inside us is important to begin imbuing at an early age. When shall we begin, when someone is an adult? I think about the improvement it will make in their lives to realize they should always weigh their thoughts. That they should not always “just do what you feel.” Think, even if for the moment, reconsider your actions. Am I acting out of raw impulse, or are my actions influenced at all by my thoughts. I believe in this message for our youth, for our teens, and yes, I believe in it for ourselves as well. How important were books to you when you were a child? In terms of personal growth and maturity, books were extremely important to me as a child.The only problem was that I wasn’t aware of it at the time. I never opened a book, never read. My dad always said, “Read a book. It will develop your mind.” I was into competitive sports. Now, years later, I’m sorry I didn’t take that advice more seriously. A mind is, indeed, a precious thing. The positive side is I’m repeating that advice to my own kids, and with some of them, thankfully, its sticking.What are some fun facts about you? Fun facts. Fun facts. Unfortunately, I’ll really have to share a LOL with you on that one. I guess, you’d really need to rephrase that to get it down. Something more like, What are some non-fun facts about you? In kind of a nutshell, my whole life is fun. The only thing I like more than to laugh, is when I get someone else to laugh. Our home is full, 24/7,with students and guests who come to meet up with the guy who wrote all those books, worked in a prison and has a black belt in karate. that;s fun. My dear wife, of 28 very quickly passing years, Miriam, is a serious scholar who runs an entire department at the seminary here in Kfar Chabad. I even get her to laugh a lot. That’s fun. Finally, our seven kids get us both to laugh a real lot — that’s the most fun of all. Before signing off, I’d like to thank the publisher, Israel Book Shop, a great company for all their help and assistance. Click here to purchase the books. This entry was posted on Wednesday, December 23rd, 2009 at 4:15 pm and is filed under Meet the Author, New Books. You can follow any responses to this entry through the RSS 2.0 feed. You can leave a response, or trackback from your own site. The author finds a way to instill powerful life lessons in Jewish children through the Two Kings series. A true masterpiece. We love it! Can’t wait for more installments. Thanks for sharing the interview from my blog! It was a pleasure to interview Rabbi Jacobs about his books. Something not mentioned in the above interview. First, the response to both installments of Two Kings (1 &2) have been, b”H, remarkable. From all over the world, I’ve been receiving emails with similar toned remarks. Here are some examples. The teacher asked her to explain. My daughter did. The teacher then asked her where she knew this from, to which she reported we had bought a new book……. Needless to say, the teacher was more than happy with this answer. The teacher was happy. With responses like these, so am I. To the public, please keep writing us. I’ve given these books to several children who are totally mesmerized by them. One saw it at my home (I had purchased it for a different child.) and wanted to take it home with him….and he did ! What a great compliment to the author. The stories are beautifully written and the artwork is gorgeous making the book a masterful work. Couldn’t imagine topping the first book but he did it again with the 2nd. WOW in advance for the 3rd. Keep ’em coming. My son loves the Two Kings series, and we are able to use the adorable good king and bad king to instill in him a knowledge of right and wrong from an early age. I highly recommend this book series for kids.